When style counts, you can count on our Colorful Cotton Yoga Blankets! 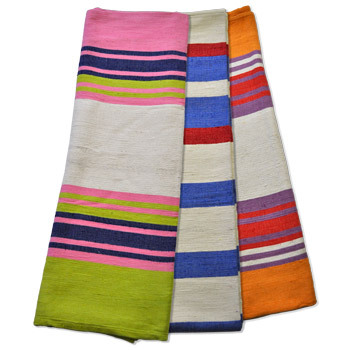 Bold stripes impart plenty of sass and personality on these tassel-free yoga blankets. Use blankets to help support your poses, as a versatile yoga prop. You will also love snuggling under our blankets in savasana or using them outside the studio on a picnic or the beach! Or, throw over a chair or couch to bring a splash of color to any living space. Choose from standard weight or heavy weight (view specs above). These blankets are handwoven out of 100% eco-friendly cotton. All of our cotton blankets can be hand washed and hung to dry. I use these cotton blankets for specific purposes in yoga practice and healing work to contrast with my wool blankets. I love them for their softness and warmth. Love this blanket...all cotton, heavy, beautiful, and NO tassels. I plan to order more. These are great colours and I like the tight weave, however the edging is quite a bit thicker than the blanket. It becomes bulky when you fold the blanket multiple times, at the place where the edging is. So the blanket is never completely flat all over when folded or rolled. These are really wonderful blankets. They have vibrant colors and are very soft. They are a more tightly-woven weave than traditional yoga blankets, and are thinner, so not as bulky but still keep you warm. Very cheerful and decorative also. And huge! A great value. I was disappointed in these blankets for yoga blankets. The seam is too thick and when folded creating an uneven surface to lay on. The weave is not dense. It is thick strands of lovely soft cotton woven together like a rag rug. I am concerned about the way they will hold up over years of studio use and washing. The colors and the soft cotton are wonderful. They would make a nice blanket for home use, picnics, and the beach, but not the best choice for yoga in my opinion.